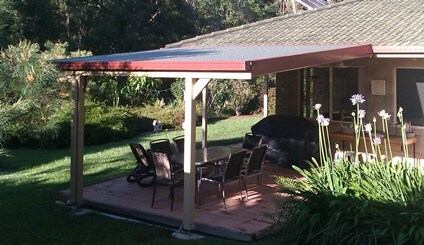 Pergola covers can take many forms depending on your need. You may only need pergola shade rather than a roof, or just a mechanism to grow a shading vine. For my structure, I needed a rain proof roof so I chose corrugated colorbond sheeting. I measured, cut and pre-sealed and painted enough battens to ensure spaces or not more than 900mm between them. I used countersunk tech screws to secure them to the joists. I set the first and last just inside the plates. The next step was to install punched strapping (below right) corner to corner to add diagonal bracing to the roof structure to stop it twisting in wind. Now was a good time to paint the pergola. It was easy to do it without the roof on as I didn't have to cut-in beside and under the iron. The next step was to set up the gutter on the front plate. 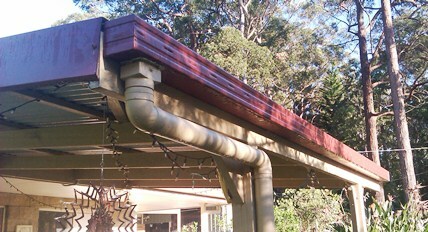 See my DIY Guttering Page for a full outline of guttering system installation. 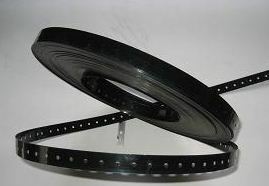 Bend up the ends of the lower corrugations on the top end of each sheet to inhibit flow back of water. Lay the first pre-cut roofing sheet on the 'prevailing wind' side of the structure and position it to have a 50 mm overhang into the gutter. Drill in a couple of tech screws on the upper corrugations to keep it steady. Overlap the second by two corrugations each time. Drill in tech screws every second corrugation. Overlap the last so that it finishes adjacent to the last joist. The next step is to install the side barges. This is just a matter of measuring, cutting and fitting with smaller tech screws down the top side. Lastly, fit the flashing over the gutter and iron ends to prevent water coming through the structures junction with the house. And don't forget the down-piping. So that is the last installment of my pergola project. 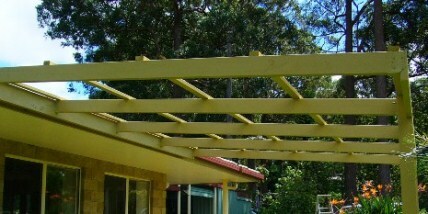 Go back to Pergola Designs or return to Kithomebasics home page.